Brick Street Bakery is competing to be named the “Sweetest Bakery in America” and we need your help. From March 1 to July 31, Dawn Foods invites communities to vote for their favorite bakery to win the title of “Sweetest Bakery in America.” Voters can submit one entry per day in-store and online at www.sweetestbakeryinamerica.com. Dawn Foods will name one national grand prize winner, second and third-place national winners, and winners in each state. The national winner receives publicity support, a celebration party and an innovation session to create even more delicious treats. State winners also receive support to promote their bakeries. Please show your support for Brick Street Bakery and cast your vote today! Plain Talk Books and Coffee is an enthusiastic supporter of the local arts. 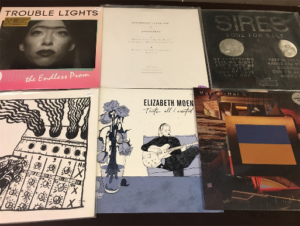 Along with hosting live musical acts and art shows, we sell records and art made by local and regional musicians and artists. 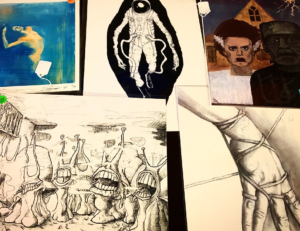 We have rock and roll records, metal, folk, and more, as well as a variety of drawings and original artwork for sale. Come check out our collection. You won't be disappointed! 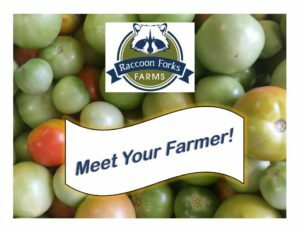 Raccoon Forks Farms is having a party, and you’re invited! Meet Your Farmer! is a chance to connect with local food fans and learn more about what we’re up to at the Farms. Along with lots of good conversation, we’ll have live music, door prizes, and tasty food raised at the Farms and prepared by the great crew at Railroad Bill’s Dining Car. We’ll also be selling summer CSA shares and other items from the Farms. Where does your food come from? Join us for Meet Your Farmer! and find out how we raise ours - locally, sustainably, and chemical-free! Time: Open house, 5-7 p.m. Questions? Please call or email. Hope you can join us - we’d really love to see you!